1-2 Remix (Yoshi) is the thirtieth sample level in Super Mario Maker, based off of Yoshi's Island 2 from Super Mario World. 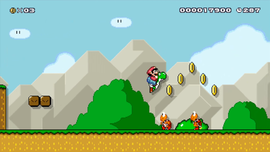 As such, it is set in the ground theme and in the Super Mario World game style. The level is practically the same as in the original, except with added sound effects and Hammer Bros. In addition to this, Chargin' Chucks (which are not present in the game) and Jumping Piranha Plants are absent. This page was last edited on May 1, 2018, at 00:24.